Basalt wood shop teacher Eric Pedersen is donating his time to teach students how to start a business in light industry. Basalt High students are building cold frames with help from architect Michael Thompson (left), Rachel Conner of (co)studio (2nd from left), and wood shop teacher Eric Pedersen (right). BASALT – Making a profit is the incentive for a unique woodshop class at Basalt High School. Students of divergent ethnic groups are working to mass-produce cold frames, an affordable product that will extend the growing season for local gardeners and farmers. Cold frames are portable, plastic-covered growing spaces that keep seedlings warm in early spring and keep frosts at bay in late fall. 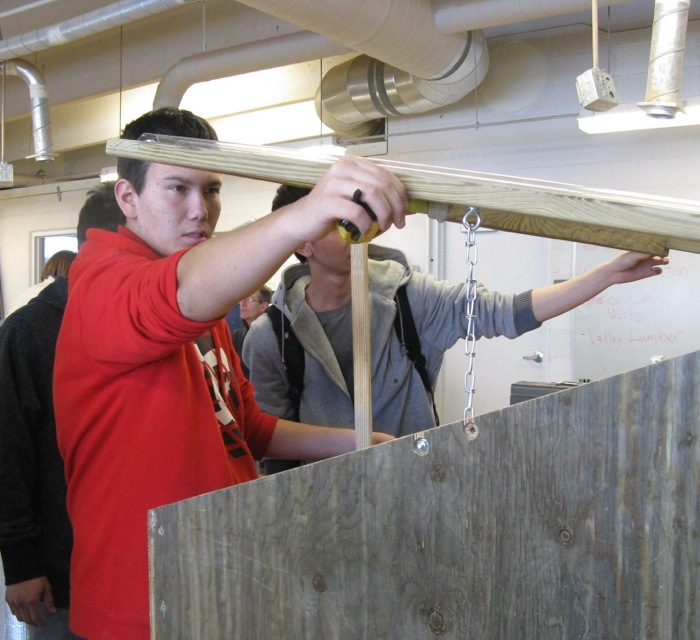 Students in Eric Pedersen’s woodshop class are not only building cold frames. They designed them and fabricated scale models with help from community mentors. Conner works through (co)studio, an educational initiative that offers design/build classes at three high schools in the Roaring Fork Valley – Glenwood Springs, Basalt, and Carbondale. This program is funded by donations and infuses core subject learning with design thinking, hands-on technical training, and industry relevant mentorships. Conner initiated the cold-frames project with Pedersen last spring. The two worked the program through the school administration as an accredited class. Pedersen has been teaching for 20 years at Basalt High, and he’s donating his time for a project that demands hundreds of hours. “Eric believes in what we’re trying to do,” Conner said. “The real thrust,” Pedersen said, “is doing a start-up and creating a business. These students are taking it from concept to design to development to market research to sales. They do cost projections and profit calculations. They do marketing and will create a brochure. “Basically, it’s light manufacturing with hands-on skills, and it’s about growing food. I read on a website that if you grow your own food, you’re a radical,” he said. This technical drawing by Basalt senior Carlos Cervantes shows promise for an aspiring architect. The class started with technical drawings, which were a stretch for most of the students. “We wanted them to build something smaller to develop their skills,” said Conner, who suggested that a greenhouse might be possible next year. A student in Eric Pedersen's wood shop class measures the cover of a prototype cold frame at Basalt High. The students divided into teams of two to create competing designs and models. Dave Argo, of No Name Architects in Glenwood Springs, volunteered as a mentor and worked with the students on technical drawings. Before the drawings, however, Conner and Glenwood Springs teacher Mathew Miller challenged the student teams to design containers for a variety of vegetables. The students had only cardboard and tape at their disposal. Argo then taught elevation, plan sections and precision in designs from which they made their scale models. Those designs and models were then critiqued by architects like Basalt greenhouse designer Michael Thompson, a professional mentor for the program. 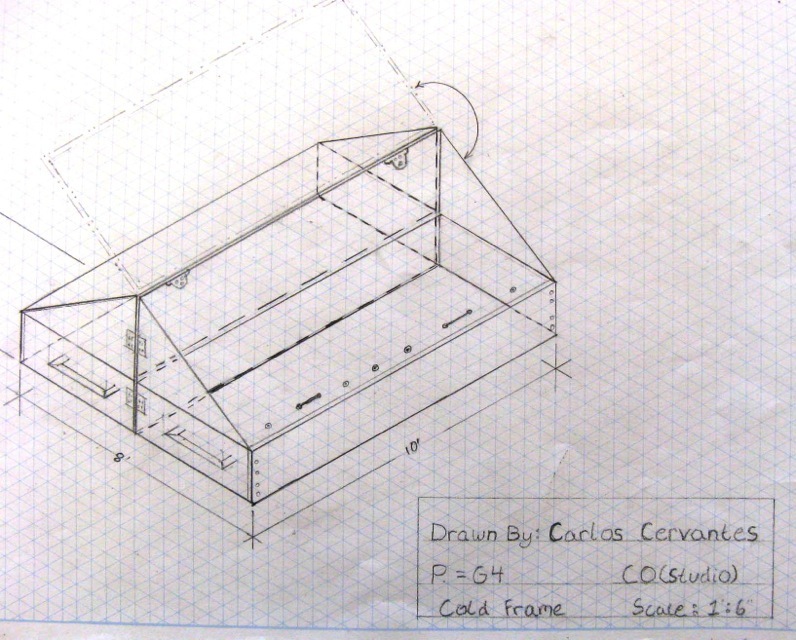 The winning design became the template for the cold-frame prototype that students completed last week. “The technical drawings and scale models were difficult assignments,” Pedersen said. 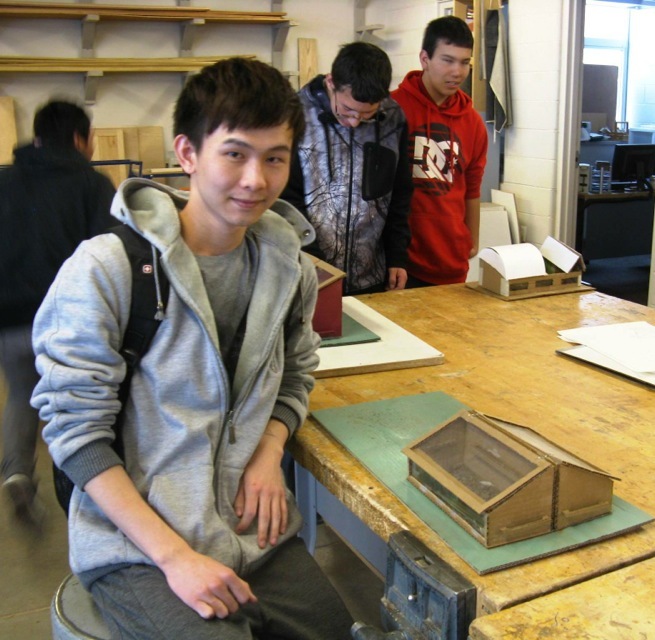 Scale models fabricated from technical drawings challenged Basalt students like Ming-Xiong Li. Conner lined up donors like American Clay Works, a greenhouse-supply company in Denver run by Scott Swenson, who provided a discount on materials. Lowes, in Glenwood Springs, gave material donations and discounts on other supplies. Valley Lumber in the Basalt Trade Center offered materials if someone would match half of the cost. Mark Regan of Regan Construction stepped up and made that gift happen. The town of Basalt gave $500 to the project. When it was done Pedersen’s students had a total $2,500 worth of materials to work with, including high-quality polycarbonate plastic for the cold frame covers. Students are making two cold frame sizes for potential customers, the larger at 4-by-8 feet. “Now that we’ve made a prototype, we’ll make them faster as a quality product through an assembly line.” Pedersen said. When asked what the class will do with those profits, Gerardo Martinez had a ready answer. “We’ll save the money and invest it in a full-size greenhouse for next year,” he said. “We’ve learned in this class that one-half of all Americans try to create their own businesses,” Pedersen said. “We don’t want to lose that entrepreneurial spirit, so these students are having that experience. “Another important part of this is community involvement with education mentors. The idea is to build community that way,” Pedersen said. “It’s a kind of enterprise club where different skills are mentored by community experts,” Thompson said. Editor’s note: This story was done in collaboration with the Aspen Journalism Land Desk and The Aspen Times, which published a version of it on Monday, Feb. 24, 2014.